Haystack Campground is located on the eastern shore of Haystack Reservoir and is surrounded by native vegetation including sage brush and juniper trees, with partial views of the Three Sisters in the distance. 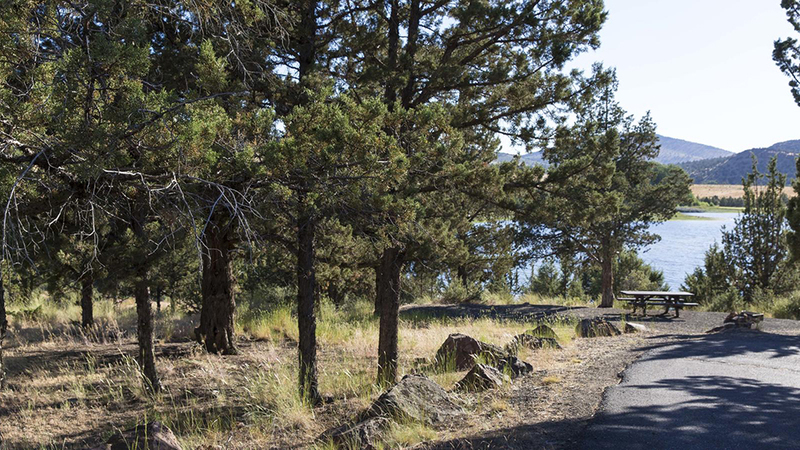 Situated in the scenic high desert of the Crooked River National Grassland, Haystack Campground offers a number of amenities and activities to visitors. There are nearby trails to accommodate hikers and mountain bikers, two horseshoe pits for campers’ use, and on hot summer days you can cool off in the water. Bring your fishing pole and cast from the beach or your boat; both motorized and nonmotorized are allowed. Amenities include an interpretive site, boat ramp, on-site camp host, drinking water, and vault toilets. The campground consists of 24 tent and RV sites, each equipped with a picnic table and fire ring/grill combination. Reservations can be made up to six months in advance, but not less than one day in advance. The camping per site per night fee is $15.00 for first vehicle, $6.00 for each additional vehicle, and $5 per vehicle or group for day use.